USA Today:– It was supposed to be a cruise vacation of their dreams, a trip to see the magical Northern Lights off Norway. Instead, it sailed into a cruise nightmare. 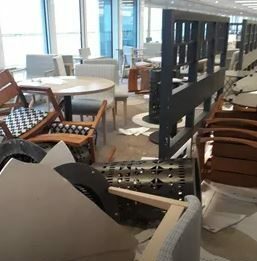 “Everything was broken: plates, glasses, furniture,” the crew member said, describing scenes in the ship’s restaurants and lounges. He said he saw a heavy grand piano go flying upside down inside a lounge. The crew member requested anonymity because he was not authorized to speak publicly. The front of the ship was the most imbalanced, he said, and was most affected by the waves. “You can’t even stand up,” he said. As a result, some of the passengers and crew couldn’t move immediately when the alarms first sounded, signalling the order to move to emergency stations.